Who is the LEOFF 1 Coalition? …and why does the Coalition ask for money? The LEOFF 1 coalition is a statewide organization that represents retired and active members of law enforcement officers and firefighters of the LEOFF 1 retirement system. 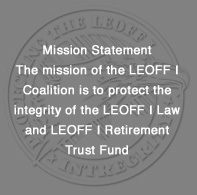 The mission of the LEOFF 1 Coalition is to protect the integrity of the LEOFF 1 law and LEOFF 1 retirement trust fund. LEOFF 1 Coalition is a non-profit 501(c)(5) organization. The LEOFF 1 Coalition’s board members are all volunteers, retired from law enforcement and firefighting. They are not paid. LEOFF 1 Coalition is not an association, and does not have annual meetings or conventions, no Christmas parties and no monthly meetings like some associations. We are here strictly to protect the LEOFF 1 law and trust fund. The LEOFF 1 Coalition does not charge membership dues. The only source of income comes from contributions from people such as you! Click here to join. Your LEOFF 1 pension funds were targeted by merger and pension raids to implement the operating budget in 2016 and 2017, which we know will continue in 2018. The LEOFF 1 Coalition only exists to protect your pension and benefit for you and your spouse, that were promised to you when you were first employed. We’re also protecting your medical benefits that could be lost in a merger. LEOFF 1 Coalition office hours 9 a.m. to 4:30 p.m., Monday-Friday.